Warner Bros. Interactive Entertainment announced back on January 24, 2017, that they were developing a Cars 3 video game, titled Cars 3: Driven to Win. 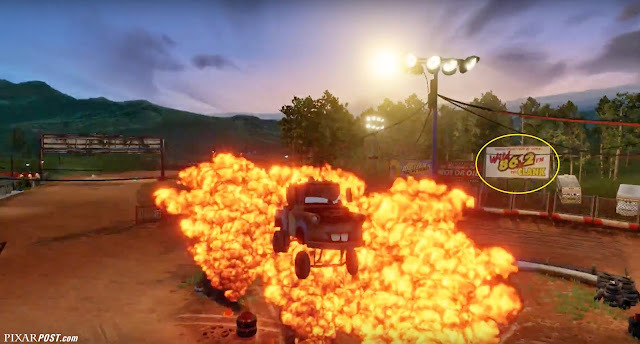 The fast-paced action game which is developed by Avalanche Software (re-opened under the Warner Bros. name) will be released on June 13, 2017, features new characters from the Cars 3 film, including several familiar faces from the Cars franchise. Pixar fans who love to find Easter Eggs will be thrilled to know that the Cars 3: Driven to Win game contains quite a few hidden items - as seen in the trailer. In the first image (below), you'll notice a new racer sponsored by TripleDent Gum. If you already hear the jingle in your head, you know that this is an Easter Egg from Pixar's Inside Out. The second image features a billboard advertising a radio station 86.2, this is a nod to the year and month that Pixar Animation Studios became incorporated - February 3, 1986. What are your thoughts on this exciting new game? Share with other Pixar fans by writing a comment below or in the Pixar Post Forum. First Look at the new Cars 3: Driven to Win video game - including hidden easter eggs.